The Mission of the library's instruction program is to educate the UMass Lowell community on the increasingly complicated information environment. 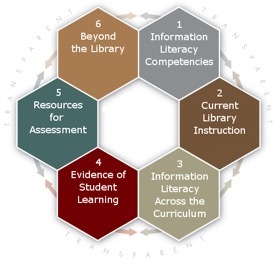 In keeping with this mission and the information literacy objectives formulated by the American Library Association (ALA), reference librarians work collaboratively with faculty to offer various types of instruction from informal, point-of-need to tailored class sessions. Librarians can also go to your class room to offer instruction. In addition to face-to-face instruction, librarians can also arrange webinars for your class, design online tutorials, and create customized research guides. Please email comments, questions or suggestions to Margaret Manion. Both Lydon and O'Leary libraries have state–of-the-art instruction/search labs. Lydon Library can accommodate up to 30 students. O’Leary Library can accommodate up to 54 students, with two at each workstation. As mentioned above, librarians can also go to your class, can arrange webinars for your class, design online tutorials, and create customized research guides. Call Lydon Reference on north campus, 978-934-3213 or O'Leary Reference on south campus, 978-934-4554. Library workshops are scheduled throughout the semester and are designed as orientations to the specifics of the University Libraries. In-depth workshops are offered on a variety of topics. Contact Lydon Reference on north campus, 978-934-3213, or O'Leary Reference on south campus, 978-934-4554, for times and subjects. Individual reference desk assistance is available anytime a reference librarian is on duty (see Hours). One-on-one consultations can be scheduled to help with in depth research questions. This process can also entail identifying relevant resources as well as formulating and executing necessary search strategies. Call Lydon Reference on north campus, 978-934-3213 or O'Leary Reference on south campus, 978-934-4554 or connect with the Instruction Coordinator. Consulting Services. Librarians will work with faculty to discuss library resources available to support course assignments and assist faculty in developing specific library assignments. Faculty Institutes. Librarians offer a variety of special workshops for faculty during the Winter or Summer Institutes sponsored by the Faculty Teaching Center. Departmental sessions can also be arranged to update faculty about changes and/or new resources in their discipline.